Why not make it really special by adding a bottle of Prosecco for just £10?! Booking is advisable and this offer is not just available for couples but for everyone! 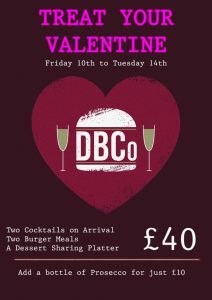 Mags4Dorset think that The Dorset Burger company is great! We're a social bunch here at the DBCo. Please follow us on one of our many social media channels to keep pup to date with all we have to offer, competitions and more.